Thinking about starting a bookkeeping business? Bookkeepers are always in demand, and if you are good at organizing financial information, it might be the right business idea for you. Follow these steps to start your own bookkeeping service. Sometimes the best business ideas are simply finding something that people could do but don’t have the time, the education, or the personality type to do well. That may be why bookkeepers are always in demand. Some people are organized—others are not. Surely, you know somebody who is super smart but a quick look at their office reveals organizational disaster. Maybe you’re the type of person that organizes for fun. The idea of a closet in shambles or a stack of bills and bank statements that need addressed may be your idea of a great time. If that’s true, you would probably love being a bookkeeper. According to the Bureau of Labor Statistics, the 2012 median salary for Bookkeepers was $35,170 per year–$16.91 per hour. The industry is expected to add about 204,000 positions through 2022—an average rate of growth compared to other professions. But these stats reference somebody who works directly for a single company. According to Entrepreneur, independent bookkeepers make between $25 and $40 per hour depending on where they work and the nature of the job. As you become more established and gain more clients, you may consider bringing in a partner or small staff. Some bookkeepers establish larger companies with hundreds of clients but first, you have to land enough clients to sustain yourself, personally. Some formal training will help establish credibility but as long as you have some formal experience managing the financial affairs of a company or organization, you can start your business right away. Here’s how to get started. You don’t have to become a certified public account but in a world where so many people advertise themselves as experts, it’s hard to stand out from the crowd if you have no training. Community colleges offer bookkeeping courses and some offer additional or specialized services including tax preparation, loan packaging, and software training. The popular account software, Quickbooks, offers certification programs, for example. 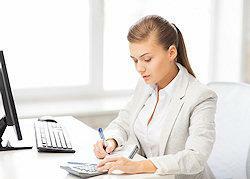 You can also become a Certified Bookkeeper through the American Institute of Professional Bookkeepers. Step 2- Home Office or Office Building? If you’re just starting out, don’t quit your day job. An advantage to this type of business is the ability to take on clients you can service after hours. These clients will likely come from contacts you’ve made in your current job. In time, your increasing client mode will force you to make the decision: Is it time to quit your job and devote all of your time to bookkeeping or keep your business part time? New independent bookkeepers often work from home. They may meet clients in their home office or at a local coffee shop but some advise to rent a small office as soon as possible. Because clients trust you with their money, having an ultra-professional working environment may be important to some of your clients. And don’t forget privacy. If you have children or other people living with you, clients may see your home as an insecure environment. Finally, having meetings at your home might make your clients feel uncomfortable. Look for a company that offers office space for rent as needed instead of a traditional lease. Larger cities tend to have places like this. Ask friends who are business owners if they have extra space for rent, and if that fails, look at traditional office space. Single office rentals aren’t as outlandish as you might think. Laws in your state may require that you establish a formalized business structure. A limited liability company, or LLC, is the most common type of business structure for small businesses. In most states it’s easy to set up and costs less than $100. Go to your state’s Secretary of State website to learn how. There are also business registration services that can help. Because of the nature of the business, consider insurance. Errors and omissions insurance is a common type of insurance held by bookkeepers but general liability is another option. E&O insurance is cheap—some policies are around $25 per month. At the beginning, clients aren’t going to find you; you have to find them. Prepare some basic marketing materials. If you have an eye for design, you may be able to create these materials yourself. If not, there are plenty of templates for sale and freelance designers that can help for a reasonable price. Ask others in the industry what clients find to be important. Look at marketing copy from bookkeeping firms and observe what they stress. They’ve already done the research for you based on their experience in the business. If they stress something, so should you. Also create a basic website. Unless your business model will exist mostly online, keep your site simple and professional. Only include the important information. No fluff. After that, do some old-fashioned marketing. Work your contact list, go door to door reaching out to small businesses and individuals, and attend community events. Start with people who know you from your current job and branch out. Once you become more established, clients will find you through word of mouth but plan to always market. Any business that survives beyond the startup phase knows this instinctively. Going over the top with customer service, is what makes you stand out. Are you available after hours? Do you have a network of trusted professionals you can refer clients to when they need something outside of your expertise? Are you fast an error free? Did you remember to acknowledge their birthday or their child’s high school graduation? Great service isn’t a strategy; it’s thoughtfulness—taking an interest in your clients as individuals will make you a stand out. Customers in all businesses complain of the lack of a personal, human touch in business. This is an easy way to stand out. If you love numbers, organization, and some financial grunt work, bookkeeping is the perfect business for you. Don’t quit your day job. Start small, care about your clients, do a fantastic job, and soon enough, you’ll be your own boss if that is your goal. © 2015 Attard Communications, Inc.